Sri Baktavatsala Perumal temple in Thirukannamangai is situated around 5 kms from Thiruvarur. This temple is glorified in the Divya Prabandham. River Cauvery branches into two and runs either side of the temple in the shape of a Garland. The temple was built by Cholas during late 8th century AD, and is estimated to be 1200 years old. The temple has a 5 tier raja gopuram at the entrance. This kshetram is called as Sapt amrita Kshetram(seven elements of nature), referring to seven of its elements being the Temple Vimanam, Mandapam, aaranyam (forest), theertham (pushkarni or temple tank), kshetram(location of the temple), river and a populated town. Thirukkanna Mangai Aandan, the diciple of Nadhamunigal was born here. As per legend ,Chandran (the Moon) was said to have taken a holy bath in the pushkarani found in this place and got rid of his curse. Godess Mahalakshmi is said to have performed a penance here and after having a bath in the pushkarani she married Bhaktavatsala perumal. Hence she is called as "Abishegavalli" and this place is also known as "Lakshmi Vanam". There is a pillared hall leading to the sannidhi of Kannamangai Thayar.There's a very old bee hive in her sannathi. It is beleived that great rishis transformed themselves as bees so that they can be here forever. Daily pooja are performed to this hive even today. It is beleived that even a one day's stay here at this kshetram guarentees 'moksha'. An idol of Buddha is seen in this temple.The idol of Vaikunta Nathan and Vishnu on his Garuda are beautiful sculptures. It is beleived that Shiva has taken four forms to guard the four corners of the temple. The temple tank is very large and beautiful and is situated right in front of the temple and is considered one of the largest temple tanks in the state. The Moolavar of this kshetram is Bhaktavatsala perumal and he stands at more than six feet tall. He is also known as Bhaktaraavi perumal. The Moolavar is in standing posture facing the east. 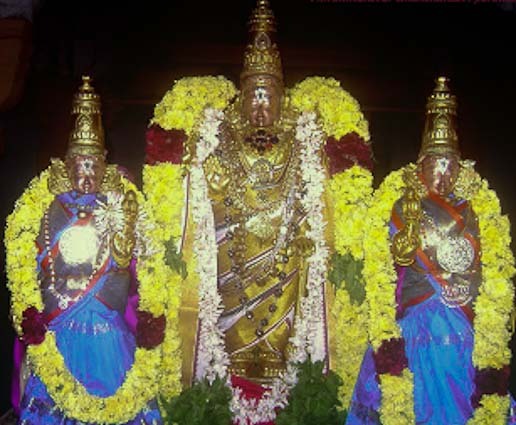 Prathyaksham for Lord Varuna and Romasa Munivar. The Thayaar in this sthalam is Abhishekavalli and has a separate sannadhi. Where to Stay? There are no big hotels here. The best place to stay is in Tiruvarur or Kumbakonam. Other interesting places around Thirukannmangai Kumbakonam, Thirucherai another of the 108 divya desams.